No, this isn’t a post about austerity. It’s the time of year when you look outside and see that the garden no longer looks full and vibrant. It just looks like it needs to be … a bit tidier. That’s not just the falling leaves (which I wrote about last Autumn), it’s due to the plants which are starting to die back. Their flowers are fading and they may be going brown or starting to flop in heaps across the beds. So the effect is less like the picture above, and more like the one below. Most of the herbaceous plants in your garden (ie the ones which don’t form a woody framework) will benefit from being cut back before they go dormant over winter. There is a balance to strike at this point. Some of your plants may still be looking reasonably good. But how much longer will they last, and when will you have time in the next month or so to do the job? This is a job which is usually best done in a single burst, rather than removing each different plant as it fades – which can just leave odd gaps and take more time overall. So set yourself a bit of time during October for a good cutting back and clearing session. As usual there are exceptions. 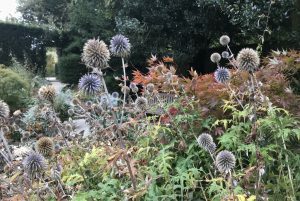 You may want to leave plants which have interesting seed heads and stay standing straight, to provide interesting structure over winter. Echinops (globe thistle), Eryngium (sea holly) and many grasses are good examples of this. Plants which are only half hardy will also benefit from being left standing over winter, as the extra matter will help protect the crown through the colder months: Penstemon and Perovskia fall in to this category (and also develop a slightly woody structure rather than being strictly herbaceous). For these, cutting back is best left until the weather warms and the plant starts sprouting again, around March. Plants which are tender, and need to be lifted and brought inside, such as dahlias, pelargoniums, cannas and some salvias can generally be left until they have been hit by a frost to bring in. But if you could combine this job with cutting back and, along with removing annual summer bedding plants, leave a clear and neat space where your border was. It’s good to set yourself up with the right tools for the job. Secateurs are the standard, so make sure yours are clean and sharp before you start. As some of you will already know, I find that Niwaki, who import specialist tools from Japan, provide great quality products. 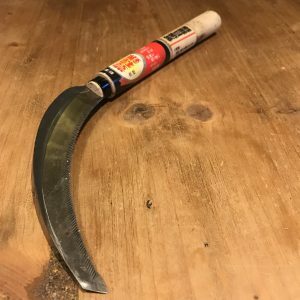 In addition to secateurs, a sickle or hand scythe is a more unusual tool, which can speed up the job if you have largish clumps to tackle. Niwaki.com has a range of Japanese sickles for this job. A sickle won’t make as clean a cut as a pair of secateurs, but will enable you to remove whole clumps in a single cut. You could also have a pair of loppers to hand, in case you encounter something which has grown a really thick and tough stem over the growing season. A rake will help you clear and pick up the debris after cutting. You may want to consider laying a groundsheet along the edge of the border, which means you can pile heaps of cleared waste directly on to it, and step on and off the bed without spreading mud and debris on your path or lawn. The actual process is simple enough. 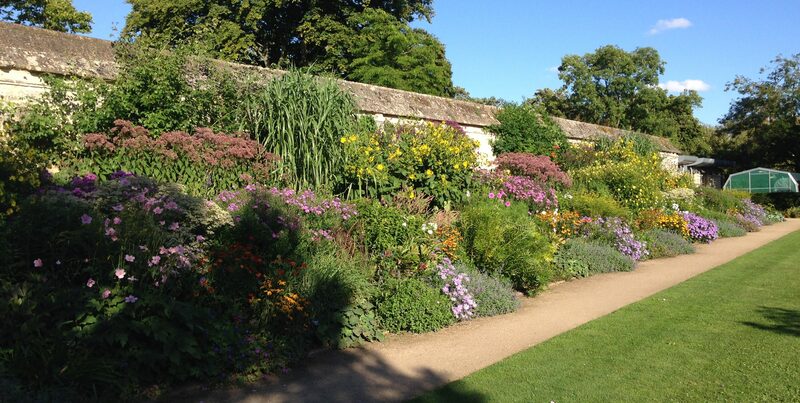 Work your way along the border, cutting the plants down to around an inch from the ground. It may seem a little barbaric, but it will do good in the long run. With some plants you may see that there is already a small amount of new growth around the base, others will just leave woody stems. Both are fine. These plants will now gradually go dormant for the winter, and grow again from the base in spring. 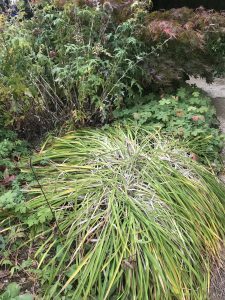 By cutting back, you are ensuring that the plant will grow back unimpeded by old stems left from the previous year, and grow at an even height and spread for next year. If you want to ensure a tidy look, try to cut all the stems to a similar length, or cut them to form a small dome, with the old stems in the middle around half an inch higher than the ones around the edge. Once you have cut back, it is an ideal time to feed your border, by mulching it. To mulch, apply and even layer of compost, around 4-6” thick, over the top of the border. 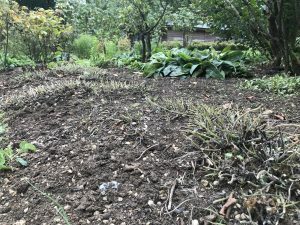 Do not mulch over plants, including the ones you have just cut back, but leave a “collar” – a ring of a few inches – of bare soil around the plant. This will also enhance a neat and even look, retain moisture in the soil, and suppress the growth of weeds in the coming months.